There are ways to quit your job gracefully and to say all the right things. There are also some things that you should never say when you’re moving on, even if you’re thinking them and you would love an opportunity to vent. It can be tempting to lash out at an employer after you have resigned, especially if you believe that you have been mistreated or underappreciated. However, be aware that your final words and actions can create a lasting impression that will work against you in the future. There isn’t any point in burning bridges. You’ll feel better momentarily because you vented, but it’s not going to help you long term. Subsequent employers may formally or informally seek input from your past employers, whose comments about your performance may be negatively influenced by your parting shots. The best strategy is to keep all communication simple and as positive as possible. Any satisfaction derived from letting your employer know how you feel will likely be fleeting, and any negative effects can be long-lasting. Here are a few things you should avoid saying when you tender your resignation. Any commentary linking your departure to your boss's character or disposition isn’t going to help. She may have been an ogre, but if word gets back to her that you said so, she will be more likely to disparage your attitude or performance when talking to prospective employers. Don’t say that you are leaving because your boss was incompetent even if it’s true. Your manager will be more likely to ascribe any failures to you and provide a negative appraisal of your work. Don’t mention the performance or bad attitude of team members as a reason for your departure. When employers check on your background, they often seek input from staff as well as supervisors. If former subordinates or co-workers are insulted by your departing remarks, then they will be more likely to reference your shortcomings as a manager or teammate. There is no need to encourage management to perceive you as a disgruntled employee, since this characterization may be passed along to others who inquire about your tenure with the organization. If you think the company is floundering or underachieving in some way, don’t say so. Your employer will be well aware of any problems within their organization. You have nothing to gain by conveying to management that they are stuck in a bad organization while you are moving on to better things. Disloyal employees are normally frowned upon. Former supervisors will more likely assert that any limitations to your success were due to your deficiencies and not flaws in their products or services. Prospective employers will wonder if you are going to badmouth them when you move on. An abrupt departure can be used to substantiate allegations that you weren't a dedicated or professional employee. 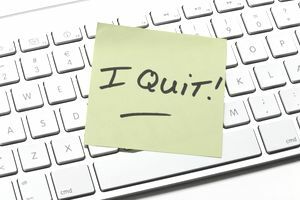 There are some circumstances where it’s acceptable to quit without notice, but in most cases, two weeks notice is the norm. It’s a good idea to demonstrate that you are a committed employee right up until the end of your employment. Cooperation that eases the transition for your boss will be remembered and often rewarded with a positive recommendation. Don’t brag about your new job to fellow employees since this can generate resentment, particularly if you imply that you are better than them. Thank others for their support and mention how you will miss working with them. Don't put anything negative in writing. Keep your resignation letter positive so all involved remember you as a positive person. Here’s how to write a resignation letter that politely states that you are leaving.